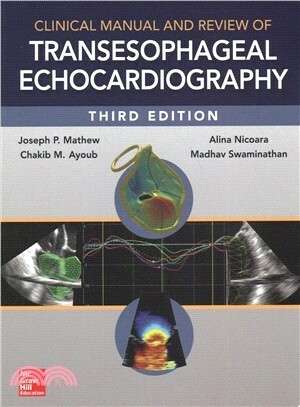 Clinical Manual and Review of Transesophageal Echocardiography, Third Edition is written to be the field’s go-to resource and the standard reference textbook on the topic. It offers concise yet comprehensive coverage of the key principles, concepts, and developing practice of transesophageal echocardiography. Completely updated, reorganized, and expanded, this Third Edition features a sectional format, each containing chapters that were reviewed and revised to provide a comprehensive discussion of physiology, pathophysiology, and echocardiographic approach for normal and common disease states. Where possible, important clinical information has been aligned with the principles of cardiovascular physiology and echocardiographic techniques. Narrative text, charts, videos, and graphs have been effectively integrated to provide rapid access to key clinical information for the purpose of improving clinical management. James Mathew, MD is Professor of Anesthesiology at Duke Medical Center. Madhav Swaminathan, MD is Associate Professor of Anesthesiology at Duke Medical Center.